Arriving TODAY is 2017 Bowman Chrome Baseball ($99.95 per Hobby box and $114.95 per HTA Choice box with 3 Autos), the most anticipated baseball product for Rookie Cards this season. 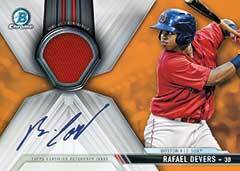 Bowman Chrome has historically been the best product to get autographed Rookie Cards of promising talents that are making a splash at the big league level now or in the future. Available as either Hobby or Home Team Advantage Choice boxes, there are certain perks to purchasing either type. Hobby boxes come with a pair of autographs along with an all-new Prospect Shimmer parallel and two 2016 Arizona Fall League Fall Stars inserts. The HTA Choice option offers up three autographs in a box instead to cut right to the chase for some collectors. The 2017 Bowman Chrome Baseball set is part of a strong annual tradition and will feature a mix of veteran players along with this season’s top freshmen. Each pack will contain two Bowman Chrome Prospects and every box has two Bowman Chrome Prospect Autographs – and those signatures will be on-card. Naturally, there will be a multitude of parallels for each veteran in the set. Basic Refractors will be the most common to pull and every other type will be sequentially numbered. The Refractor rainbow includes colors like Purple, Green, Gold, Orange (Hobby pack exclusive /25), and Red (/5). The most coveted parallels, however, are bound to be the one-of-one SuperFractors. The Chrome Propsects Autographs have regular Refractors, too. Most of the parallels will feature the same colors, but there will be Blue Refractors instead of Purple. As for the unsigned Bowman Chrome Prospects, there is a similar array of Refractors, but a limited Bowman 70th Logo Refractor is part of the lineup as well. HTA boxes have exclusive parallels of these cards, which have a unique pattern and specific Refractor types like Gold Shimmer (/50), Orange Wave (/25), and Black Limited (one-of-one). As a special treat to those buying hobby boxes, there are limited Rookie Short Print Image Variations and Bowman Chrome Prospect Shimmer parallels. The basic versions come with purple accents, but the rarer ones are sequentially numbered and are available in Green, Gold, Orange (/25), and the one-of-one Black. As mentioned above, 2017 Bowman Chrome Baseball hobby boxes contain two 2016 Arizona Fall League Fall Stars inserts. Bowman Scouts’ Updates turn the focus on big names in the prospect pipeline that are making waves in the early part of the season. 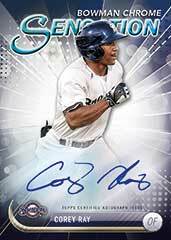 Hobby packs also offer up a shot at a short printed Willie Calhoun 2016 Arizona Fall League MVP card. Both of these insert collections have both Orange Refractors (/25) and SuperFractors (one-of-one) in addition to autograph parallels. 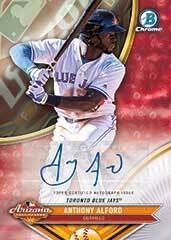 Topps also delives into the rich past of the Bowman brand by producing a Refractors that Never Were collection. The lineup is made up of cards that pre-date the Bowman Chrome era that never had a Refractor version. Collectors can look for numbered parallels in addition to autographs. 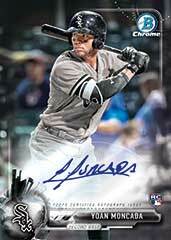 Hobby boxes of 2017 Bowman Chrome Baseball could potentially contain exclusive Chrome Sensation Autographs. These cards have a strong design and are sequentially numbered, plus both Orange Refractors (hobby exclusive /25) and one-of-one SuperFractors. All-America Game Autographs are also a neat part of this release as these cards were signed previously while the players were still in high school. Prime Chrome Signatures have a horizontal orientation and were designed in a way to allow the subject’s autograph to boldly stand out. A SuperFractor parallel (one-of-one) is also being issued and will be a tough pull. HTA packs could yield an Orange Refractor (/25). If all of the above was not enough to entice collectors, 2017 Bowman Chrome Baseball has a couple of memorabilia collections to consider. Chrome Autograph Relics are a new addition and 2016 AFL Fall Stars Relics were worn at the popular prospect showcase. Both have scarce Refractor parallels that come in Orange and Super varieties along with Gold Refractors for the former and autographs for the latter.